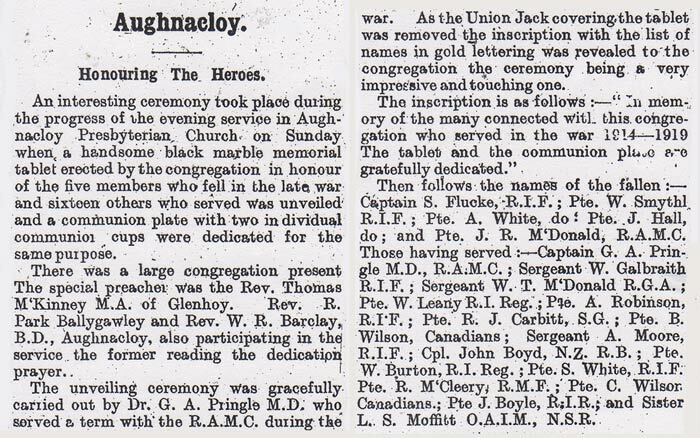 The World War One Memorial Tablet is located in Aughnacloy Presbyterian Church, which is on the B35 Road to the South East of Aughnacloy. Pte J R McDonald, R.A.M.C. Capt G A Pringle M.D., R.A.M.C. Sergeant W T McDonald, R.G.A. Pte R J Carbitt, S.G. Sister L S Moffitt, O.A.I.M., N.S.R.